Nothing was the same. At least that’s the way it seemed trying to adjust to normal life after returning home from the Pacific after World War II. The '41 Olds 98 convertible had been sold, the music on the radio was different, and most of my time was taken up in an accelerated GI Bill program finishing up my final three years at Harvard. Amid the hectic schedule, I began attending sprint car races run on dirt tracks throughout southern New England, on weekends. As it happened, a cousin, Brewster Randolph, was president of the New England Big Car Racing Association, and owned a Miller Schofield Special sprint car. In time, I bought a Four Port Riley sprint car powered by a Ford Model B engine equipped with a Riley Head and Winfield carburetors from Milton Dentch who was very active in dirt track racing. Jimmy Little from Hartford was my driver. Campaigning sprint car #27 was fun but maintenance was high with engine rebuilds were needed after every five races. In addition, usage was limited to dirt tracks. As a result, when my cousin bought a beautiful Jag XK-120, I couldn't help but notice the versatility of having a sports car in comparison. I said to myself that I would have to get one someday. By 1951, the desire to own a sports car caused me to visit a Boston area Jaguar dealer intent on buying a new XK-120. The dealer had other thoughts and apparently did not think I was worthy of a Jaguar so I ended up walking out of the showroom without a car. My disappointment didn’t last long. Contemplating my situation, I recalled reading a review of an Allard K2 equipped with a Cadillac V8 in the December 1950 issue of Road and Track, and decided to visit R/P Imported Motor Car Company, the famous New York City Allard dealer located at 143-147 West 54th Street. Shortly after, I purchased a K2 (serial #1844) from R/P’s Major Richard D. Seddon who had Perry B. Fina install the engine. 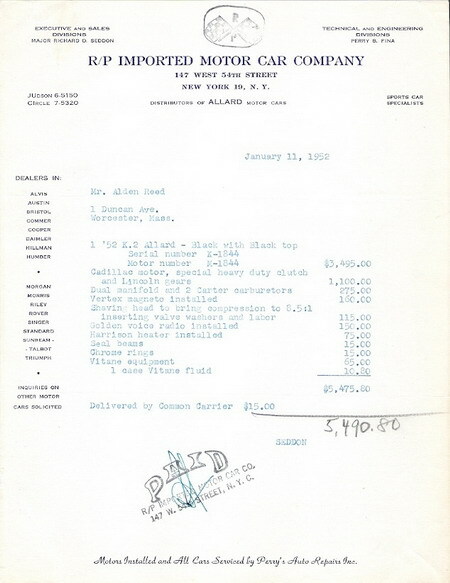 Original paperwork still with the car indicates the final cost came to just under $5,500. I picked up the K2 on January 11, 1952. R/P’s staff stood at attention on the sidewalk to bid me farewell as I drove off down the streets of New York, that cold winter day. Little would I have guessed that fifty-eight years later I would still be driving the same K2! As it worked out, the Allard was never really my primary transportation and has always been garaged--sometimes for extended periods--both of which have helped preserve the car. The odometer currently reads only 42,000 miles. The car has been kept in original maintained condition. The K2 is equipped with a unique dealer installed accessory--Vitane injection produced by Thompson Products of Cleveland. 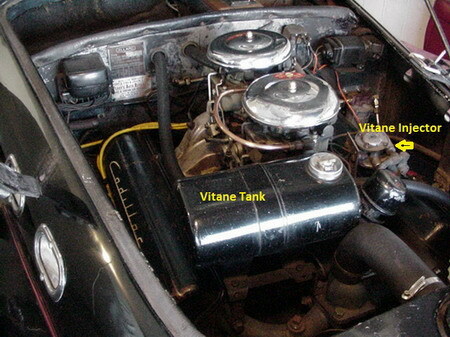 The device injects Vitane anti-knock power fluid into the forward carburetor. The carburetors on this K2 are fed by an electric fuel pump. 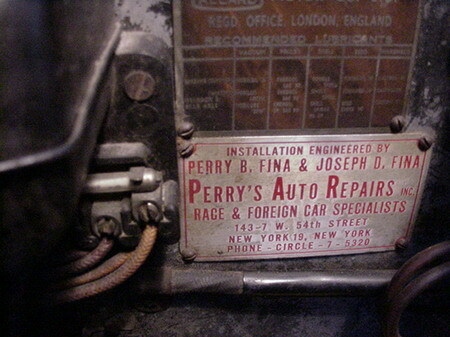 A progressive linkage delays the opening of the forward carburetor until the car is moving about 40 mph. Other standard equipment includes a black canvas top, four side curtains, tool roll, and owner's manual. The 3-speed manual transmission (Ford side-shifter with Lincoln Zephyr gears) is a traditional H-pattern floor shift. First gear is not synchromesh so the car needs to be brought to a stop before engaging. Shifting from 1st to 2nd is a long reach and needs to be done with care. However, with so much torque, the car can be brought to nearly a stop in 3rd and easily stepped on without shifting down. The car has not been raced but is capable of doing over 140 mph. It served once as the pace car for midget racing at the old Westboro Speedway, which in its day billed itself as the fastest 1/4 mile in the east. The K2 also ran some performance laps against a Jag XK 120 on the original sports car circuit at Thompson Speedway before a scheduled race. 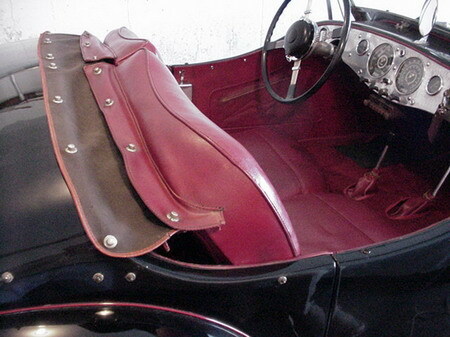 The XK 120 could not keep up to the Allard K2 much to the chagrin of the button down banker-type who owned the Jaguar. The K2 also actively rallied with the Worcester Area Sports Car Club in the early 1950's, and when the club held its 25th anniversary a number of years ago, the car became an impromptu centerpiece during a lawn party celebration. What is it that continues to keep Allards in the forefront of vintage sports car enthusiasts? Is it their unique looks? Wind in the face driving? The roar of the exhaust? The camaraderie? Whatever it is there is no question that it is great to see all the interest and enthusiasm in Allards, today.